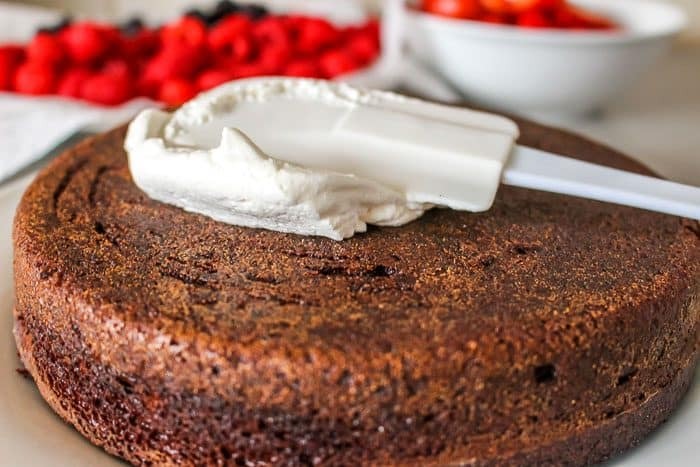 This is our absolute favorite chocolate fresh fruit cake with whipped cream! 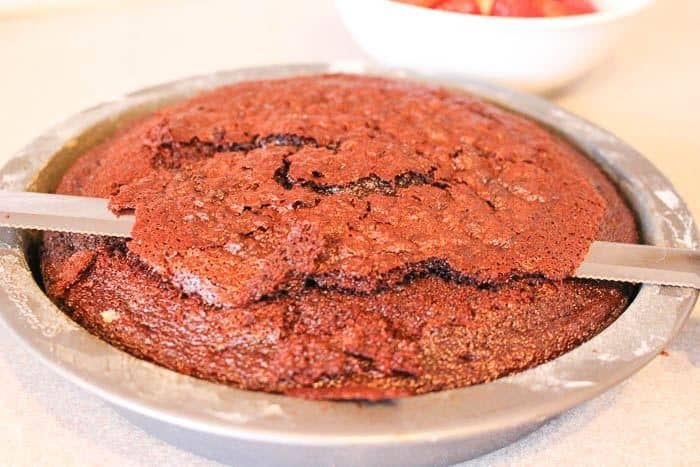 Because it’s made from scratch (using an easy and fast one bowl chocolate cake recipe), it has a fresh, wholesome taste that everyone in our family absolutely loves. This chocolate whipped cream cake can be made with any fruit you love. 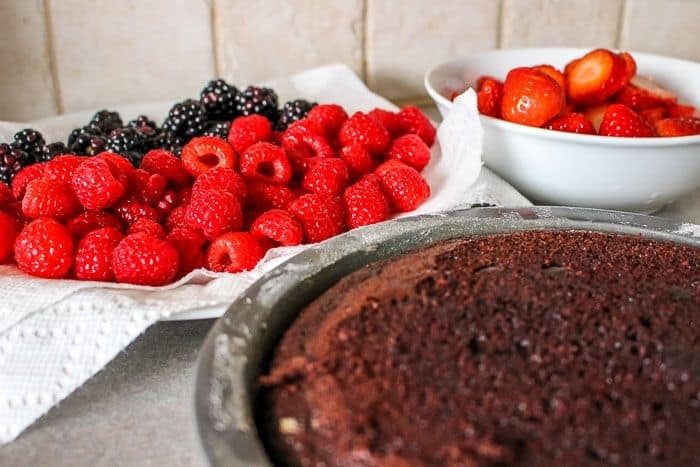 We’re huge fans of berries, and love it fresh and home made, so we make this chocolate strawberry cake from scratch using home grown fruit whenever we can. 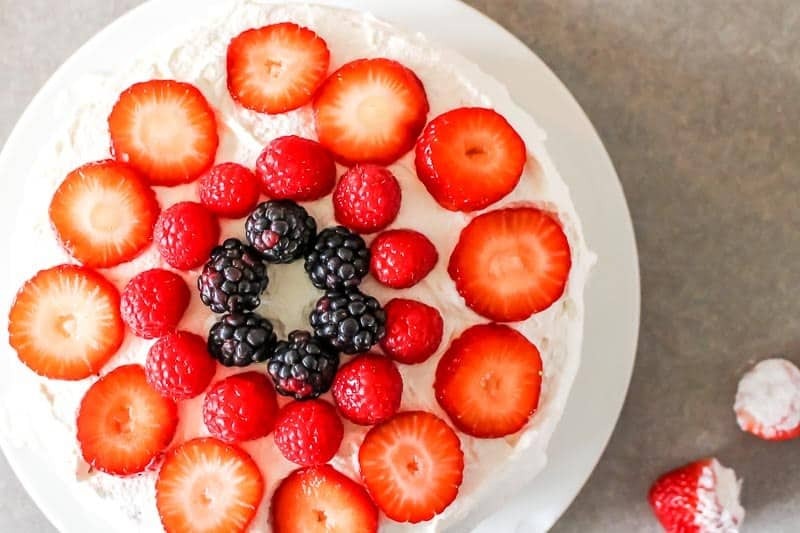 Every year, our garden produces a crazy abundance of fresh strawberries and raspberries (and even occasionally blackberries), and that’s the perfect time to make this cake. Store bought fruit is delicious too, but home grown fruit has a special flavor. You know what I’m talking about! In this version, I added raspberries and blackberries as well as the strawberries, but it’s also delicious using only strawberries. I’ve also made it using blueberries in the past and that’s was a delicious treat. You really can’t go wrong. Just be careful if you use a fruit that has a lot of liquid (like oranges), to drain a bit of the liquid so you don’t get a sloppy mess. This is also our go-to homemade cake for birthday parties and other celebrations at our place. It’s one of those dishes that looks really fancy, but that doesn’t actually take a lot of skill to put together. Yay for that, because, while I’m usually a good cook, I just don’t have the time or inclination to always make my meals look beautiful. This pretty much comes out gorgeous on it’s own, and I love that! My Aunt Agnes used to make a version of this when I was growing up that was made with cherry filling, which was a lot more like a traditional black forest cake. Sometimes, she even drenched it in Kirsch liqueur. It was so good – it’s one of my favorite memories when I was growing up. A few years ago, my hubby suggested using fresh fruit instead, and we’ve been making this chocolate whipped cream cake the same way ever since. 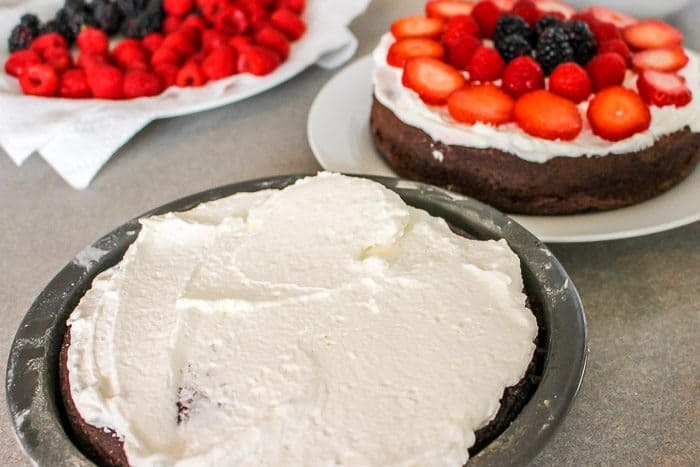 There’s something about the combination of fresh fruit, chocolate and whipped cream that’s just so delicious! 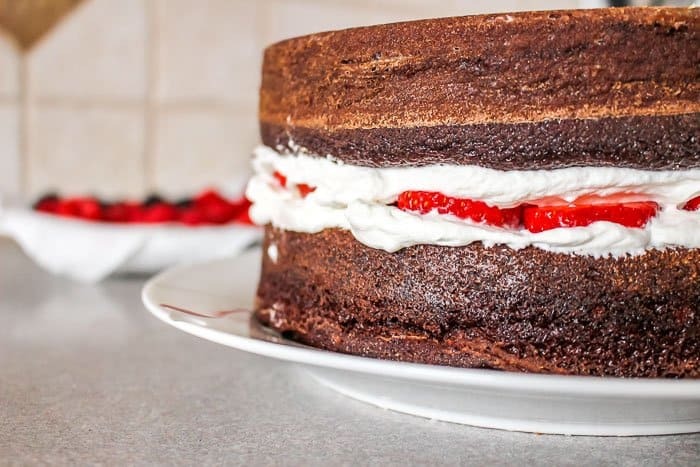 I suppose you could even call this a strawberry black forest cake, if you aren’t being too traditional, since black forest is almost always made with cherries. However, using fake whipped cream in a can or from a tub (like Reddiwhip or something similar) really just ruins the cake. Make sure you take the 10 minutes to make real, fresh, homemade whipped cream. The success of this recipe depends upon it! Here’s what you’ll need to make this easy one bowl chocolate cake. This is our go-to recipe in our house, as it’s easy, fast, and fun to make. Tip! Scroll down to make sure you have ingredients on hand for the whipped cream, and fruit! This one bowl cake recipe is very similar to our delicious never fail chocolate cupcake recipe – so good, and so easy! Grease and flour two round 9 inch cake pans. Tip: Here’s how to grease and flour a pan. Using your fingers or a pastry brush, spread 1 1/2 tbsps of canola or another cooking oil evenly on the sides and bottom of each cake pan. Shake 2 tbsp of white flour into each pan and shake it around, being sure to evenly coat the bottom and sides. Shake excess flour into the garbage. You can also spray with non-stick spray instead, but I find that the cakes are much less likely to stick if you use the grease and flour method here. In a large bowl, mix sugar, flour, cocoa, baking powder, baking soda and salt. You can hand mix, or use a electric mixer, either works well. Add the eggs, milk, oil and vanilla then mix with the electric mixer for two minutes, or hand mix for about four minutes. Add the boiling water last. This is important – the batter will be thin. It’s about the consistency of paint – much thinner than most batter! Don’t worry, this is OK.
Bake 30 to 35 minutes. Test with a toothpick for doneness. Cool in the pans for at least an hour. This homemade whipped cream recipe is easy and delicious. The whipped cream is crucial to the success of the recipe, so make sure to use fresh homemade whipped cream, and not whipped cream in a can, or an artificial substitute. Add whipping cream, sugar, and vanilla to a large bowl. Tip! Make sure the bowl, whipping cream, and mixers are cool. If it’s 90 degrees in your kitchen, and your cream and bowl are the same temperature, you’ll have a heck of a time getting the cream to whip. If your kitchen is warm, pop the bowl and beaters into the freezer for half an hour to cool them down. Using an electric mixer, beat on medium, until stiff peaks form. You can also do this by hand with a whisk (and I have! ), but be prepared for a 10 minute workout. 4 cups of fresh fruit, washed. Slice the strawberries. You can use only strawberries, or a mix of 2 cups strawberries, 1 cup blackberries, and 1 cup raspberries like we did here. 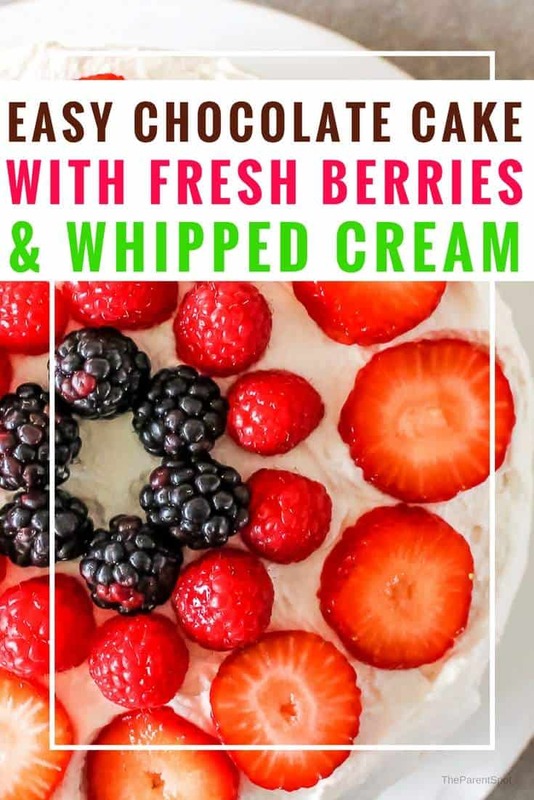 Now, assemble the freshly whipped cream, berries, and chocolate cake into a delicious, tasty mixture. It takes about 10 minutes to make this chocolate with strawberry cake. 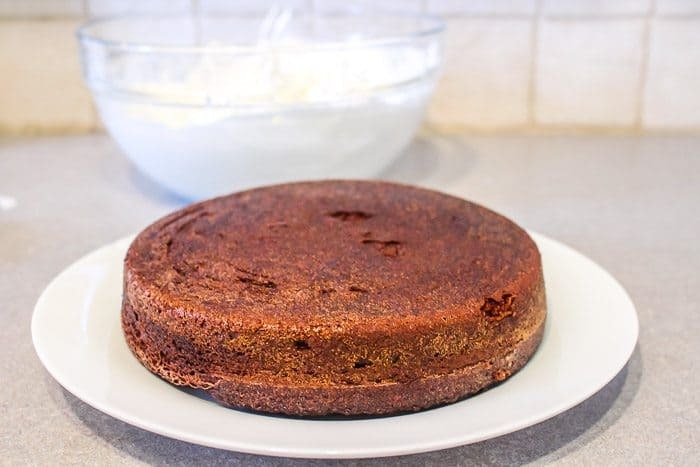 Take your cakes, and using the pan sides as a guide, skim off the rounded top. We do this so that it sets a little easier on the plate, and doesn’t tip over. Do this for both cakes! Tip! This is a perfect time to pass off the extra bit you cut off the top to impatient kids or spouses! Now, your first cake is ready to be placed on the serving dish. Turn the first cake upside down, and drop gently on your serving dish. Because we’re not fancy, we just used a white dinner plate. Next, take about 1/2 cup of whipped cream, and spread evenly over first half of cake. 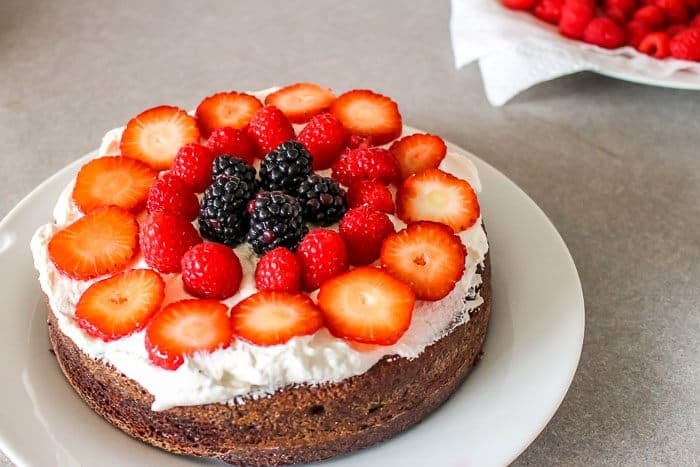 Top with one layer of berries. You can use our pattern, or arrange them any way you like. Next, take your second cake, and while it’s still in the pan, spread with 1/2 cup of whipped cream. Now, take the second layer, turn it upside down and place over the first layer. It should look like this. Now, honestly, this is good enough to eat right here, but I like to ice the cake with more whipped cream and berries. 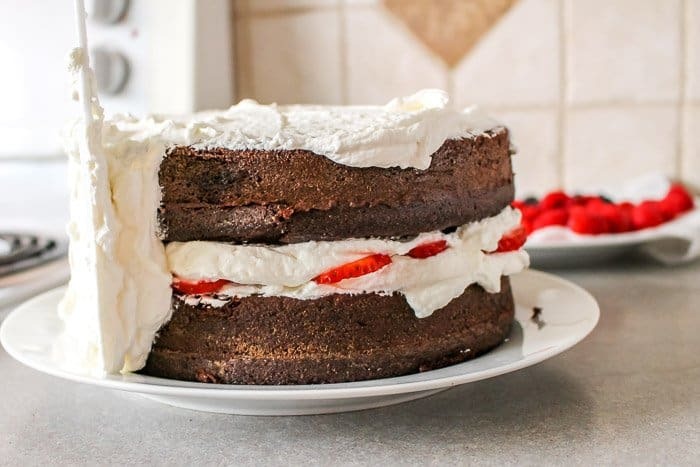 You’re almost done making this chocolate cake with strawberries and whipped cream! Take about 1 cup of the whipped cream, and spread around the top and sides. 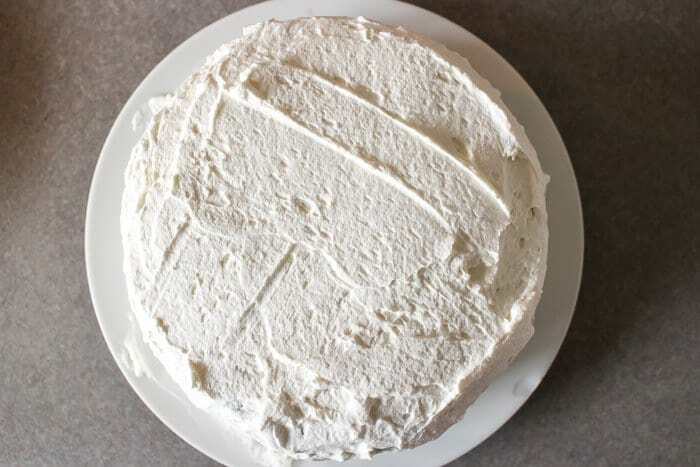 It can be a little tricky to avoid picking up crumbs when you’re icing, so I like to almost dab the whipped cream on, and then just spread it lightly to finish icing. When you’re done, you’re ready to add more berries to the top. 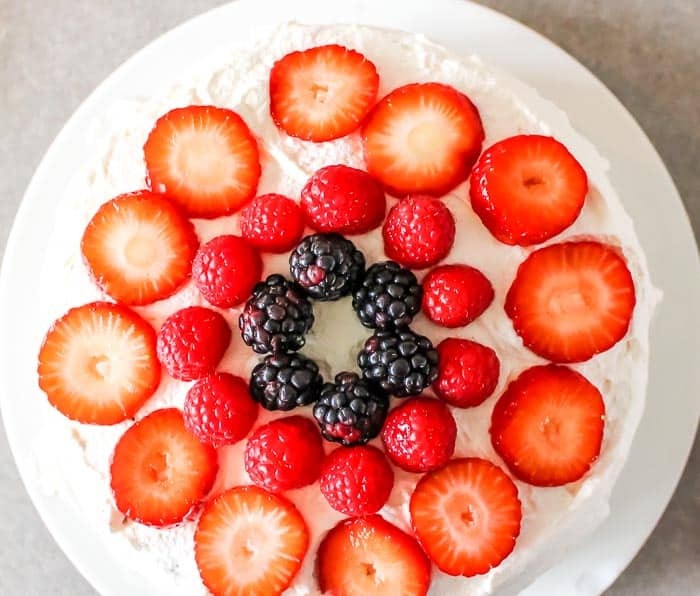 Arrange the final berries on top in whatever pattern strikes your fancy. If you look closely, I’ve managed to lay the berries pretty uneven but it still looks nice. That’s it, you’re done! Whether you call it a black forest cake with strawberries or a chocolate whipped cream cake with fresh fruit, either way – it’s delicious! Looking for another delicious dessert recipe? Okay, this looks delicious! I love the berries you put as the topping, healthy! Oh Wow! This looks Incredible! And thanks for all the tips on grease and flour, whipping cream etc. very helpful! Can’t wait to try this. Easy to make and very pretty.